The neighborhood where we live has a community mailbox. It is not far from our house, so we either stop on our way home from running errands, or walk down everyday. My children are always filled with anticipation as I open the box...did they get anything today??? I am filled with anticipation too, is there anything other than ads or bill statements? Did I get anything today??? I love getting mail, and really, I love sending mail too. I love picking out the perfect card for someone and am more likely to send a "just because" card than I am a holiday, birthday or thank you card. 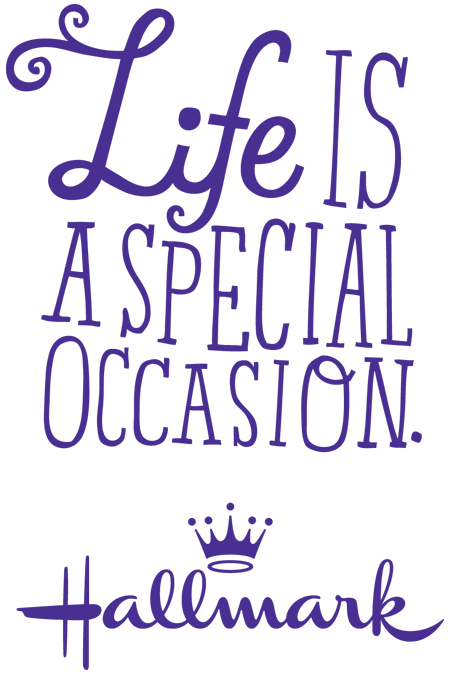 I am so excited to announce that I am going to be partnering with Hallmark this year to talk about how Life is a Special Occasion. You might remember I wrote about this earlier in the year, finding the special occasion in everyday moments. This is something that keeps those seemingly mundane every day moments from becoming just another moment. Hallmark recently gave me the Get Carded Challenge. They sent me a package a cards with the challenge to send a card to 7 different people. 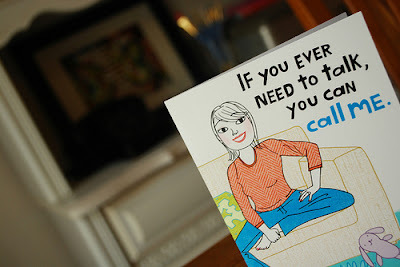 I wish I could sit down and send a different card everyday, but really, my kids and my life don't allow that. So, on Sunday afternoon, while the kids were playing with Daddy and the baby was sleeping, I sat down and thought about my friends. I read through the cards and thought about who needed one this week. It was such a great opportunity to listen to my heart and know who in my life needed a little pick me up in the mail. It was really hard to narrow it down to 7, and to be honest...I didn't. I just couldn't. I sent 10!!! I sent to my Parents, my friends Kate, Heidi and Loralee -- all back in my sweet Mountain town in Utah. I sent to Arianne, Sara Sophia, Heather and my sister-in-law Melissa -- 4 of my heart-gut friends. and, I sent to Candida, one of my dearest friends here in Texas. The cards I sent each of these people were the words of my heart. Some were funny, some were short, some were long winded, some were sentimental -- but all of them celebrated friendships and that everyday special occasion that comes with them. 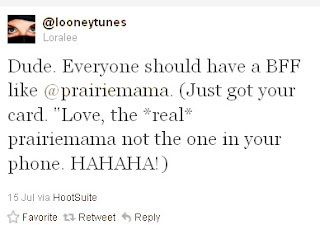 The first person I heard back from was Loralee. 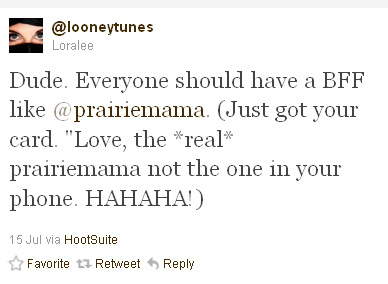 And in typical Loralee fashion, it was a tweet that made me giggle! Then, I got a sweet email from my girlfriend Kate. She and I used to have nice long sit down chats. You know the ones where kids are running in and out and you get interrupted fifteen gazillion times, but you always come away feeling so much better about life? Yeah, those kinds of chats. I miss those, and the card I sent her said just that -- I miss you friend. I also heard from my dear friend Candida. She is a sweet Southern nut Belle, and as only she can, she said, "Oh girl, you crazy" when we were talking about the card. That is her way of telling me she loved it. This experience has also prompted Arianne and me to start being penpals. I feel the same giddy anticipation as I did in 3rd grade when I got my first penpal. I can't wait. This making a connection with each other is what life is all about. All too often we type (((hug))) or "lol" or "btdt, xo". And while that is helpful, there is something so much more meaningful about a handwritten card. It shows a moment taken to sit, contemplate, and write (without the benefit of backspace or editing) to those who we love. You can join in the fun of this challenge by liking Hallmark on Facebook. Also, you totally should sign up for the free e-newsletter. It is full of great ideas and fun ways to celebrate the everyday special occasions. Hallmark wants to spread the love around and so they are offering 10 of my readers card packs, so you too can get carded! I will send cards to the first 10 people who comment on this post. Also (totally inspired by my darling friend Stephanie!) I will choose a winner at random for a fun gifty from me! I want to hear from each and every one of you. I don't care where in the world you live, if you win, I will send you something. I will choose a winner on Monday, July 25 at 9 PM CDT. So leave a comment. Tell me about the last time you sent or received a card. How did it make you feel? Hallmark provided all cards, postage, and prizes for this Get Carded challenge, and is compensating me for this sponsored post. As always, all content and opinions expressed are my own. I love sending and receiving "real mail!". My daughter got baptized a few weeks ago and was absolutely thrilled to get cards in the mail. I absolutely agree with you that it speaks more of thoughtfulness and love. I sent cards to my close friend who lost her son last year. She needed (and still needs) to know how much I love and support her. I think i owe her a card. I love sending cards! Last week I found the perfect card to send my bff. We were college roommates and have tons of great moments together. Now we live 2 hrs away and I miss her so much. Also, I almost broke my leg running to the computer to post a comment (I was reading via my blackberry and it's hard to comment from the phone). Then I eeeked! out loud. Hallmark picked the right girl! 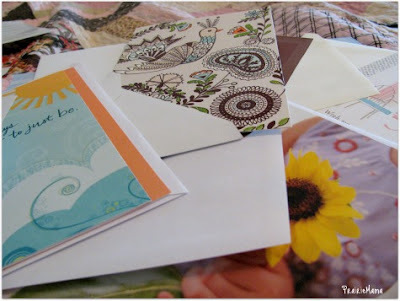 I also love love love snail mail and try to make a point in sending out random letters. Yours was perfect...except it made me miss you more! 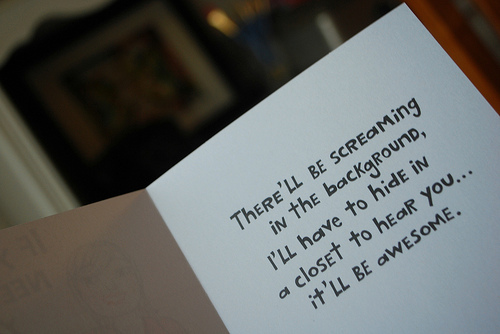 and I love the one you sent your friend about hiding in the closet to talk! ha ha ha too true! Now I want to find a sitter to take the kids away so I can have a hot cup of chai (yes it is crazy hot here, but I am just not an iced chai girl) and write letters all day! Miss you friend!!!! Kim....I love this idea!! I have been thinking I need to sit down and send a card once a week to someone different. So many people I have come to love and as strong as I think they are...I know all of us could use a pick me up!!! Thanks for this...I am soooo glad you are here in Austin!!! Hugs Girl!!! Oh, I love "real" mail. And I LOVE sending cards. I used to be pretty good at it too, but somewhere in the last couple years with that 3rd child I dropped the ball. I should definitely recommit to that! A couple of weeks ago. Someone anonymous from church about a lesson I taught. It was so sweet and meaningful, it brought tears to my eyes and I'm STILL thinking about it! I love sending cards (and getting them too) I am so bad at it, I have a stack of cards and so I thank you for the reminder to get my rear in gear and spread some love around. I remember having a pen pal from about 4th grade up until 9th. I don't know what happened but one day the letters just stopped being answered and it made me very sad. I sent one to my gym to let them know what a great Zumba teacher they have on staff. Hope the nice thoughts got to her eventually! I LOVE having penpals. Had lots of them in elementary, and getting letters was the BEST.THING.EVER. Meant to comment that the last card I got was for our anniversary (just last week)..from my dear, sweet Gramma! She also tucked in some money! Not for us, but for our littlest ones to get them a puddle pool for this hot HOT Tennessee summer! My oldest brother is a rockstar at letter writing. We always get random cards and letters from him even though we're always current via email. I love it. I usually get cards from my mom, and occasionally the in-laws. I was really great about sending funky, weird postcards to my sibs while I was in college - my favorite was one from Idaho that had a steaming potato on a fork and said "Idaho - It's HOT!" Ohh yeah. Awesome. I really need to find some weird Pennsylvania postcards to send my sibs now. I love sending cards, but like so many others I get caught up in daily life and don't take the time to get them and send them. It is meaningful, and I wish that I would do it more. I am SO sad that I am not one of the first 10 to comment on this post- I would LOVE LOVE LOVE a gift pack of cards to handwrite sweet nothings to those who mean the most to me, especially given how crazy busy my life is of late. It is so important and really, a handwritten card is way better than a text or a tweet. Oh well, maybe next time, right?!!! My mom sends cards to my kids all the time and they just LOVE it! She even sends them postcards to them when she is on vacation. The last person I sent a card to was my sister inlaw who is stationed in Baghdad (with her husband). It is her Birthday on Friday.